a high-tech warship can usually beat at least 2 lower-tech warships. a high-tech empire can usually out-produce, out-farm (if not Lithovore) and out-research a larger but lower-tech empire, so a small early advantage in technology tends to grow during the course of the game. Miniaturization and weapons modifications. The next page explains these unusual and important concepts. 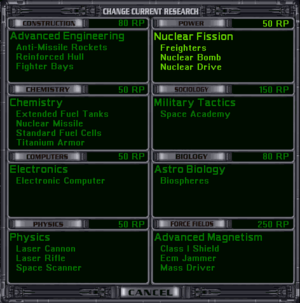 Details of the techs in each subject area, and recommended choices for non-Creative empires. Recommended research paths for various types of empire. it consists of 8 subjects with no interdependencies. In theory you could research all the way to the top level of 1 subject and neglect the rest, but this would almost always be suicidal. each subject is a straight sequence of levels, with no side branches. Most levels contain 2 to 3 techs, but a few contain only 1. This guide follows the usual convention, identifying tech levels by their costs in RPs. Non-Creative empires must choose 1 tech from each level - they can get the others only by conquest, espionage or trading with other empires. Creative empires research all the techs at the chosen level simultaneously, for the same number of RPs that just one of these techs would cost a non-Creative empire. Uncreative empires get no choice, the game software randomly chooses 1 tech at each level. There are a few levels with only 1 tech. The bottom level(s) of each subject area are "general" levels, i.e. every empire gets all the techs in these levels. "Pre-warp", where you have just 1 colony and no ships, and you have to research almost everything, including the basic interstellar travel techs. At the start of a "Pre-warp" game you get a few very basic techs for free, and the these are usually described as "level 0 techs" or "starting techs". descriptions of all the techs in that level. the recommended choice(s) for non-Creative empires. After all of these there's a summary page. This page was last edited on 19 August 2012, at 22:41.